Stephen Burns was born in Dudley, Worcestershire in 1921, the oldest of the four children of John and Sarah (Sally) Burns. John Burns had served in the Gordon Highlanders during the First World War, and they moved back to his home town of Manchester for a while during Stephen’s childhood. As a reservist, his father was called up at the outset of war, and served in the Royal Engineers. Stephen Burns was working in an armaments factory in Dudley when the war started. Although he was in a reserved occupation and therefore not eligible for call up, he volunteered for the RAF in 1941, and after a period working as ground crew trained as an air gunner. After qualifying, he was posted to 57 Squadron in November 1942. There he met up with navigator Richard Macfarlane, wireless operator Bruce Gowrie, bomb aimer John Thrasher, flight engineer Edward Smith and air gunner William Maynard. who had been posted in together on 9 December 1942. The crew were without a pilot until Geoff Rice arrived in February. The crew then flew on nine operations before being posted together from 57 Squadron to the new squadron being formed at the same base to undertake training for a special mission. On the Dams Raid, Burns suffered the ignominy of being soaked by a combination of sea water and Elsan contents when AJ-H flew too low and hit the sea, and its Upkeep mine was torn away. The damage was caused by the tail wheel being forced up into the fuselage. Geoff Rice recalled his understandable reaction, shouting over the intercom: ‘Christ, it’s wet back here!’ Worse nearly followed since, as the aircraft climbed, all the water flooded into the rear turret threatening to drown its occupant. Burns had to smash the Perspex window so that it could drain out. Burns flew with Rice and the rest of his crew on the handful of successful operations tjhey undertook between the Dams Raid and December 1943, and was promoted to Flight Sergeant. However, the crew’s luck ran out on 20 December when they were hit by flak 14,000 feet above Merbes-Le Chateau in Belgium. Although Rice gave the order to bale out, there wasn’t time and the aircraft exploded. Rice seems to have been thrown clear by the explosion, and somehow landed in a wood but the bodies of the remaining six crew members were found in the wreckage, and they were buried in Gosselies Communal Cemetery, near Hainaut, Belgium. 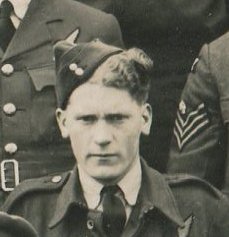 Burns had been due to be best man at the wedding of another gunner on this operation, who visited the family afterwards and told them what he had witnessed. After the war, Stephen’s brother John visited the grave, and was given a pair of gloves belonging to Stephen, which had apparently been retrieved from the wreckage by local villagers. They had taken articles from all the bodies so that if relatives came visiting, they could be given some small memento of their loved one. Chris Smith, Tales from a Churchyard, Volume 1, St John’s, Church Hill, Dudley.